This was not the post I planned to write today. It’s not a post I would ever have wished to write. But I write it today in hopes that you can help out. As some of you will know I used to frequent the Queen City Grill on a regular basis and consider the people who worked there my friends. For years the staff was mostly the same faces – pretty remarkable in the restaurant business – and walking in felt like coming home. Over the last year and a half there has been quite a lot of turnover and while the new people seem nice it just hasn’t been quite the same and so my visits have been farther between. But, if I visited on a Thursday I could still count on seeing Moses and his happy smiling face greeting me as I walked in the door. If you have even been to Queen City you have probably talked to or met Moses. He has worked there for 13 years! He emigrated to Seattle from Mexico and I believe this was the first place he ever worked. He started as a bus boy and has done a little bit of everything. In the years I’ve been stopping by he’s been bus boy, bar back, sometimes bartender and sometimes the host who greets and seats you at the door. No matter what he was doing there was always a smile and a hug and at least a little conversation to get caught up. 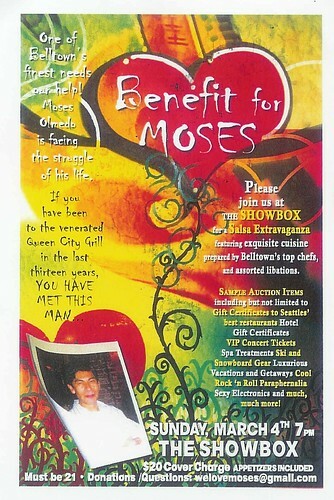 In recent years Moses has limited his working schedule at QC. His own landscaping business has been steadily growing and so his focus has changed. He bought a house a few years ago and is always working on some project there. He was very excited to get his house – as we all would be – but for Moses it meant he had a place to host family and friends when they needed help. I hardly remember a time when Moses had his house to himself. Sometimes his mother was in town for a couple of months, sometimes a sister, sometimes a nephew who needed a little help finding the straight and narrow. Moses was always taking care of someone. And the same can be said of his business. As it has grown he has hired many of the day workers who frequent the streets of Belltown, men looking for a chance to make a few dollars often to send home to family in Mexico. I happened to be early for an appointment last night and stopped by the Queen to see what was going on. While I did not expect to see Moses I was not prepared for the news I did get. In mid-January Moses was diagnosed with stage 4 stomach cancer. If there is any good news in this it is that the cancer is still contained and has not spread to other organs or lymph nodes or other parts of his body. He is currently going through a round of chemo. I didn’t ask about prognosis – I didn’t want to hear the words that might be said – but anything that starts with "stage 4" is not good. His restaurant family and friends have rallied around him and this Sunday, March 4th at 7:00pm they are hosting a benefit at The Showbox. As you may or may not know cancer treatment is very expensive. Overwhelmingly expensive in most cases. So your help is needed. Tickets for the benefit event are $20 and in addition to your entry the fee includes music and appetizers. There will be an auction including things like gift certificates to Seattle restaurants, spa treatments, concert tickets and many other items. All of the old crew from the Queen City Grill will be helping out in their area of specialty. Bartenders return to pour drinks, chefs return to cook up a storm. Moses has spent his days helping people and I hope that you can spend one evening helping him! Update: Tickets are available through Ticketmaster. The Showbox is located at First and Pike.